Former Norwegian Transport Minister Ketil Solvik-Olsen has run into problems transporting his own family to the US. Stricter US visa rules tied to the Trump Administration’s crackdown on immigration are reportedly causing problems for the veteran Progress Party politician. Solvik-Olsen was supposed to have moved at the end of the summer to the US, where his wife, who’s a doctor, had received a position at a children’s hospital in Alabama. Solvik-Olsen gave up his position as a government minister to go along for a year, and take care of the couple’s children. He had publicly stated that she had made quite a few sacrifices for the sake of his political career over the years, and now it was time for him to do the same for her. The couple also thought their children would learn a lot from living and going to school in the US. The family rented out their house in Norway three months ago, thinking they’d be flying over the Atlantic and in place in the US when school started this fall. Instead, they’re still in Norway. In the meantime, he said, the Solvik-Olsen family is living in a basement room in the home of friends. Neither he nor the children can travel until his wife’s work visa is issued, because their own visas will be tied to it as her dependents. 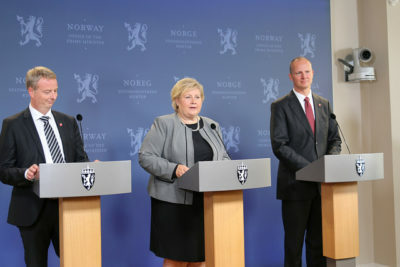 While Solvik-Olsen, who has lived in the US earlier, had to step down as transport minister, he retained his position as deputy leader of the Progress Party and plans to work remotely from the US. He also planned to be back in Norway for next year’s local election campaigns. The Solvik-Olsen family’s visas are believed to have been caught up in Trump’s tightening of visa regulations that require more thorough background checks of those applying.